A grill grate cleaner should reach and clean aaaallllll the way around the grate, don’t you think? 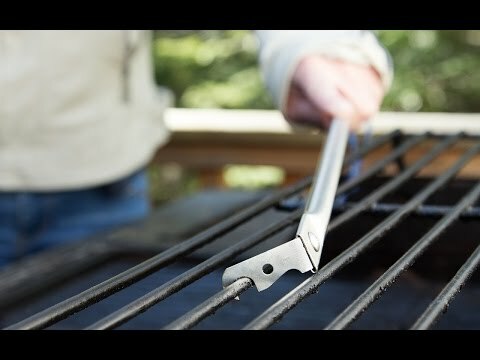 Unlike most grill brushes, the GrillFloss is designed to scrape around each grate—even the often overlooked and over-gunked bottom. Its slim metal head is dual-sided and fits around most grate sizes. 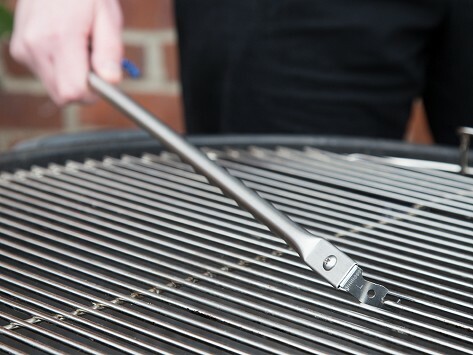 Pair it with regular passes from your grill brush, and you’ll have the cleanest grill on the block. Dimensions: 20” x 1.5” x 0.5"
Bought one for myself and one as a gift. i use mine at least once a week and my brother-in-law has thanked me over and over for his gift. Cleaning your grill grates when you’re done cooking is a good habit, but we rarely delve any deeper than the surface. How would you even reach that gunky, blackened underside? GrillFloss answers the question with a grill grate cleaner that reaches all the way around each grate. The hook-like head makes quick work of clearing away char, leftover food, and any other debris. The head is also dual-sided to fit the two most common grate sizes. It’s the perfect complement to the regular cleaning duty your grill brush does. We found GrillFloss works best when the grill is still warm, and if you use long, fluid motions—just don’t use it on porcelain or cast iron. Creators Mike Persichina and Marcus Lee met while studying Industrial Design. Mike had worked for a sheet metal company, too—making an ideal combination of skills to create this streamlined metal tool. Thanks to these two inventors, you won’t have to wonder what’s lurking below the surface of your grill anymore.